Periwinkle, Lavender and Magenta were rescued in early June off the side of the road when their foster mama and Sparkle Cat Rescue volunteer spotted them. They were on our waiting list a few weeks and they finally officially joined our program. They are healthy and combo tested negative, saw the vet for the first time on July 1. These are some super sweet babies ready to be adopted! GEORGIA has found her forever home and was adopted by her foster mama and daddy today! 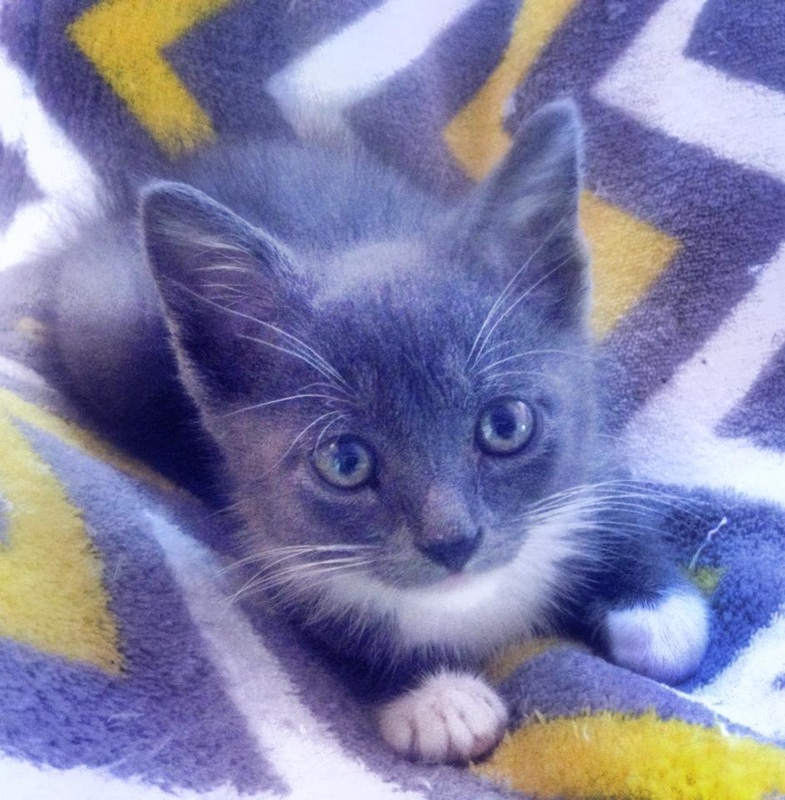 They fell in love with her over the month they have fostered her and she was the purrfect fit for their home! We are so happy she will have a lifetime of love! Georgia was rescued on December 14, 2014 after being found homeless. Reported to animal control but no one stepped forward and she was not microchipped. We had her spayed and vaccinated after her rescue! Happy Tails, sweet Georgia! Sparkle Catsistant, ROCKI passed away today, after battling an illness for over a week. It is believed he had dry FIP (not contagious or a danger to other cats he was in contact with). 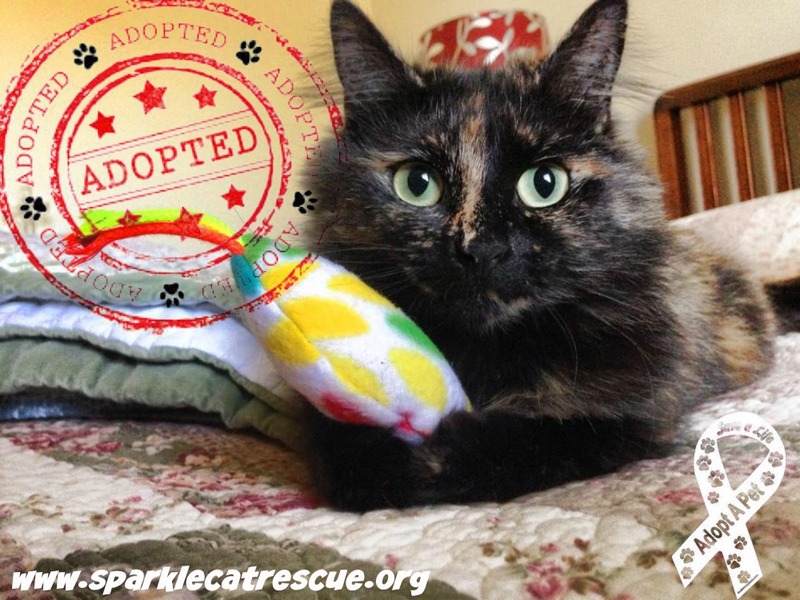 Rocki was adopted in February 2015 by co-founders of Sparkle Cat Rescue. He originally was rescued from the local animal shelter by HSAC and fostered through them and when Sparkle Cat Rescue formed we asked he be transferred to our program so we could see him through adoption. We knew he would require future medical care (although not as soon as it happened) and we wanted him to stay with the only family he ever knew. He is greatly missed. 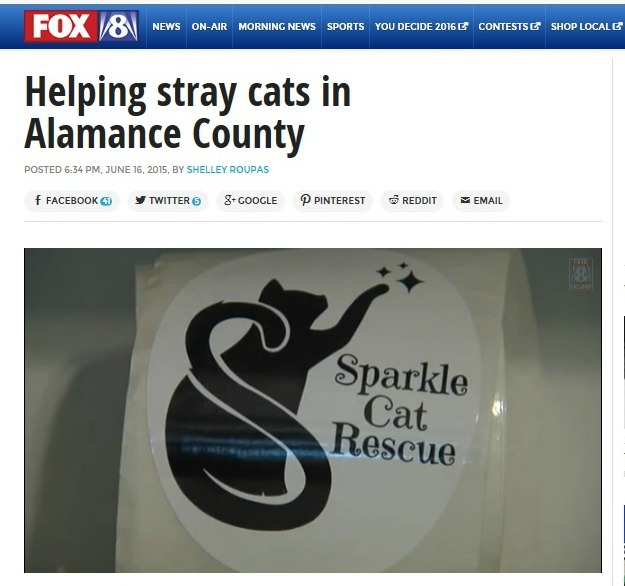 Sparkle Cat Rescue's interview with Shelley Roupas of Fox 8 WGHP, sharing our mission and stressing the importance of spay neuter to help control the overpopulation in our county and beyond. We can't save them all and need the help of other cat lovers to do TNR (trap-neuter-return) and help educate others about the importance of spaying and neutering. Thank you to our volunteer, Christina Lippard for taking Shelley to see your 'community cats' and thank you to ever...yone that loves and takes care of the cats in our community and those that you've taken in as family members and made a lifetime commitment to them! 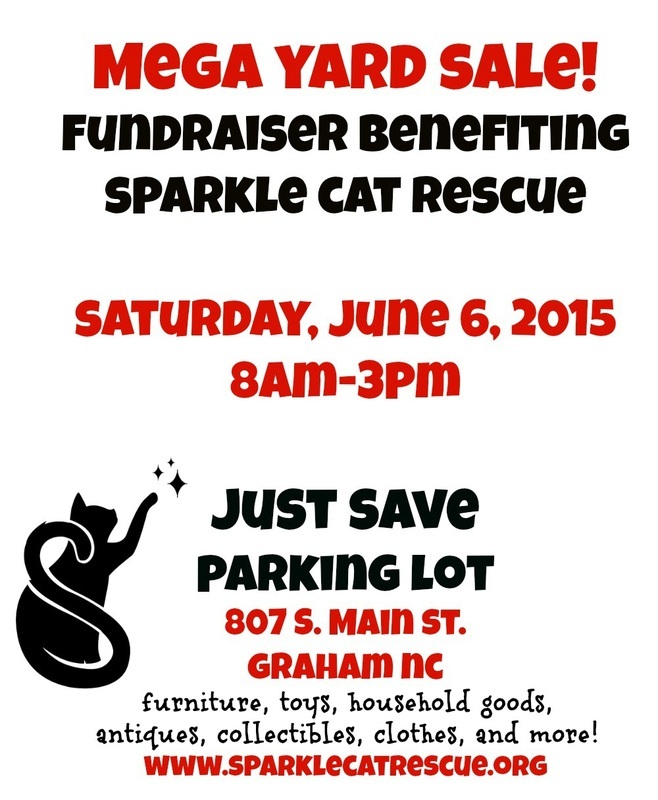 Sparkle Cat Rescue's volunteers, fosters and supporters are the reason we can do what we do! We need more fosters and donations to continue to save lives. We currently have 10 foster homes and 43 cats and kittens in our program. Founded in October, 2014 and incorporated in the State of North Carolina on November 6, 2014, we have made and will continue to make a difference in the lives of the forgotten felines! *We would like to correct that we have found homes for 40 cats and rescued over 90 (and that does not include the impact we've had with the TNR our volunteers have done and saved countless more homeless babies from being born. Thank you for your continued love and support! with Shelley Roupas of Fox8/WGHP in High Point, NC! Sparkle Cat Rescue received an email earlier this week from Sally at Feral Cat Assistance Program in Greensboro, NC to see if we could take in these six kittens and spare them from the shelter after their caretaker's landlord gave her until the end of this week to have them out. They faced certain death if taken to the shelter in Guilford County. Later we learned there were three more, making a total of 9 lives needing to be saved!! With limited fosters, we were unable to help so I did the next best thing...I networked via email with animal advocates throughout the state of North Carolina with the help of Jackie West, and shared their photos on FB (which was shared over 140 times). SHARING IS CARING and it WORKS! "Two of the 9 kittens were adopted today. The other 7 will leave tomorrow by "Ozzie To The Rescue" transport for Trenton NJ. Paws Crossed Rescue says they will have no problem finding them good homes. Thanks to Marianne Hasbrouck and Cindy Svitak for taking these sweet babies. Thank you to you and to everyone else who shared their story with friends and other rescues. 9 Lives have been saved, and tomorrow I will kiss them goodbye and wish them God speed and a happy life." We raised $2,215.00 at our yard sale! We want to thank everyone for their donations of items for our yard sale and for coming out to support us! We surpassed our initial goal of $1,000.00! All money raised is helping with vet care of our rescue kitties (spay/neuter, combo testing, vaccinations), microchip, food and litter while they are in foster care waiting to be adopted! RYDER was adopted today! His new family lives in Charlotte NC and fell in love with this sweet boy! He has a new 'brother' and a fabulous new home! We could not be happier for him! He was rescued in early May after falling out from under a truck. We suspect he had crawled up or his mama had placed him up in the truck during a heavy rainfall we had the days before he was rescued. He sure is a miracle and he will forever be a star to us! He gave us a great deal of entertainment in the few weeks he was in our care!